"I don't have any new announcements. I just want to thank the president again for the tremendous opportunity to serve this country. I'm forever grateful and proud of the men and women of DHS who work so hard every day to execute their missions and support the homeland," she told reporters outside her home on Monday, taking no questions. "... As you know, DHS has a vast array of missions. I want to make sure that we execute them all with excellence through the transition. I share the president's goal of securing the border." They just ignore the fact the Obama regime also put kids in cages and Trump's move to thwart Jeff Sessions' family separation policy led to the border being overrun by migrants bringing kids along with them as a "golden ticket" to get into the country. 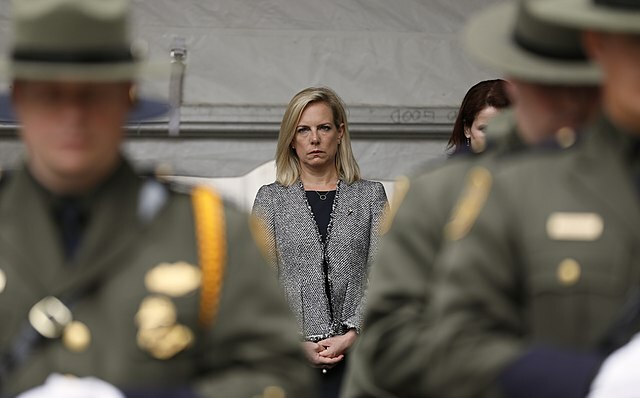 Though Trump deserves blame for that blunder (notice how caving got him literally nothing), Nielsen hasn't used any of her enormous power at DHS to secure the border. Trump got plenty of warnings telling him not to hire her in the first place but she got in regardless reportedly because John Kelly was friends with her. Now, we wait to see what other horrible pick Trump will make next. TELL IT TO ISRAEL, GOVERNOR! Hey, Rick! If you build a Medeco lock, the Medeco lock-picking business gets real good!